If you really want to make your task more simpler by automating all these processes then we need to use the build tools. On average, a developer spends 3 hours out of 10 hours of day are utilized for doing the manual tasks such as packaging,moving and compiling. If developer uses automated build tools such as Apache Ant then it will only require half an hour to complete all those manual tasks. Ant was used to build Tomcat originally. 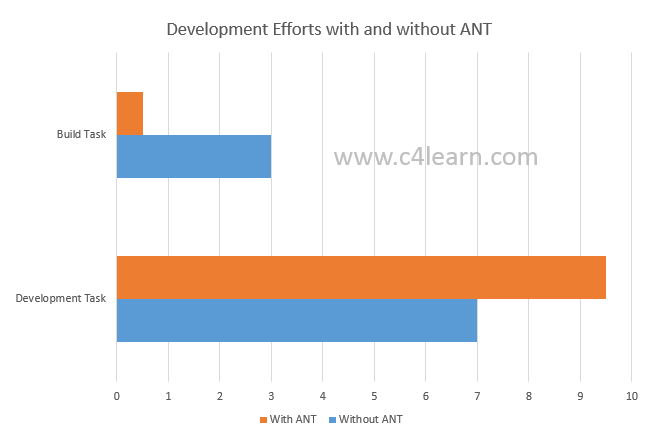 Ant is most used and complete Java build and Deployment tool available. Ant can handle platform specific properties such as file separators. Ant can handle and automate complicated repetitive tasks. Ant has lot of predefined tasks and creation of the new task is easy. Ant can invoked easily using command line and IDE such as Eclipse. In the next article we will be learning the necessary steps for setting up Ant environment.